Få en omfattende tur til LA i ditt eget tempo med denne sightseeingturen til byen. 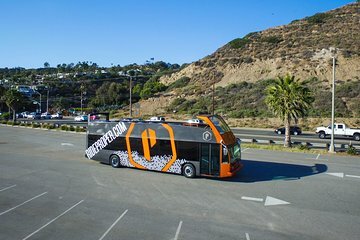 Klatre ombord på dobbel decker, åpne topp turbuss bundet til Hollywood, Beverly Hills og Sunset Strip. Få uhindret utsikt fra toppen av bussen, flott for å snappe bilder av severdighetene mens du hører på informativ fortelling. Tour varer i ca 2 timer. Gå deg til Hollywood Welcome Centre ved siden av Discovery El Capitan Theatre for å innløse din kupong. Finn et sete på begge dekkene på den komfortable bussen; Den øverste dekk på bussen har en åpen topp som gir enkel, uhindret foto ops. Når du reiser, lytt til fortellingen om severdighetene du passerer. Besøk verdensberømte Hollywood, og ta inn de imponerende severdighetene i Beverly Hills, og spenningen på Sunset Strip. Besøk de berømte studioene der ikoniske TV-programmer ble tapet, og vitne til noen av de mest glamorøse butikkene i verden. Bussen går fra kl. 10.00 til 18.00 hver dag. Se Reiseplan for en fullstendig liste over nettsteder. Tour varer i ca 2 timer. We had one day in Los Angeles and this was promoted as a hop on, hop off bus trip which we thought would keep us occupied for the day and provide a good way to see the interesting sights. The deal included a map presumably identifying the hop on, hop off locations? and discounts on certain stores presumably on the route?. This is NOT what we got. It was in fact a two-hour tour of a very limited area of downtown LA including an irritating recorded commentary which frequently didn't align to the sights in a particular location. Yes we got a map - a very low res print which had numbers on it but no key to what the numbers related to. Discount vouchers? Nope. At the end of the tour we needed to use taxis and local buses to get back to some of the locations we were interested in. I have been to LA before so I was aware of what we weren't seeing. My partner had not been there before, and he still hasn't seen much. The address given for the contact office was for the Hollywood Welcome Center. This turned out to be a very small shop front where the words Welcome Center did not appear anywhere. We walked past it at least twice before searching for the street number. We have done some excellent Viator tours in Kuala Lumpur and Nepal but after this experience I would be reluctant to risk wasting my time and money again.